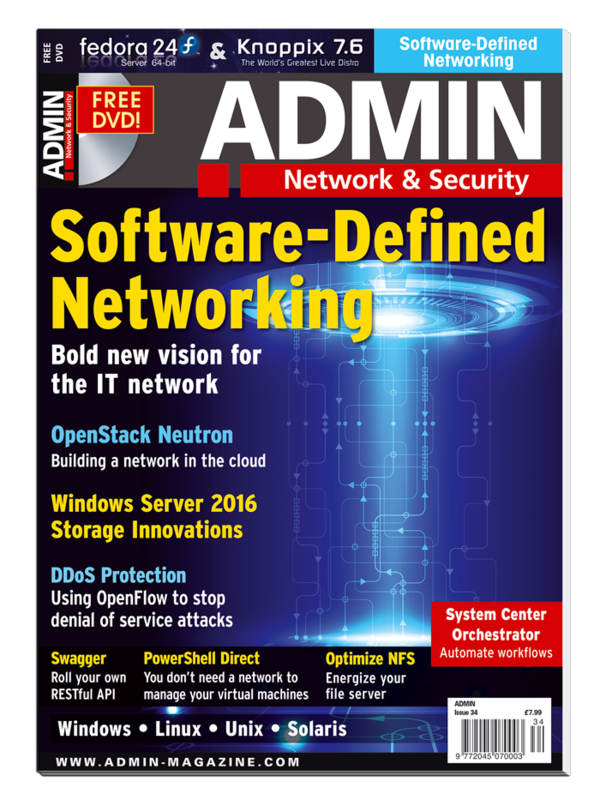 In this issue we take a close look at software-defined networking and its implications for networks of the future. Admin News Zero day UEFI exploit on laptops. Software-Defined Networking promises to cope with new demands. OpenStack integrates SDN technology through the Neutron module. This single-board system lets you experiment with OpenFlow outside the virtual world. Introducing major innovations in storage, with built-in replication, Storage Spaces Direct, and traffic shaping for storage access via QoS. Create sophisticated and resourcesaving setups - without the use of containers. The focus is on mobility, cloud usage, and speed, with in-memory processing and security. A new container for high-performance computing. A conversation with the developer of Singularity containers. API A specification and set of tools to generate interactive documentation for a REST API and matching client SDK. SCO 2012 R2 lets admins automate workflows and processes using a graphical user interface. With version 5, PowerShell can access a Hyper-V VM directly, which means you don't need to configure a virtual network connection. The FreeIPA identity management framework can be queried directly via the JSON-RPC API. System and NFS options that boost performance, make management easier, and improve security. Lowering the Drupal 8 learning curve for newbie and seasoned pro, alike. Protect yourself from infected Microsoft Office files with a multilayered approach against malware. ONA Plus visualizes nmon logs, providing ease of use and fast time to answer in performance monitoring. Store data across the network for use as a storage back end in cloud environments. IoE is a vision for a fully networked and analyzed society that seeks to enhance the quality of life of all people and drive new technologies, products, services, and markets. Discover and combat DDoS attacks, even from within your own network.